Excess mucus is produced—reducing the available space even more. These asthma symptoms are all coordinated by inflammatory components of the immune system, called leukotrienes. They are compounds originating from omega 6 fatty acids, specifically arachidonic acid and they need a specific enzyme called 5-lipoxygenase or LOX to be synthesised (manufactured). 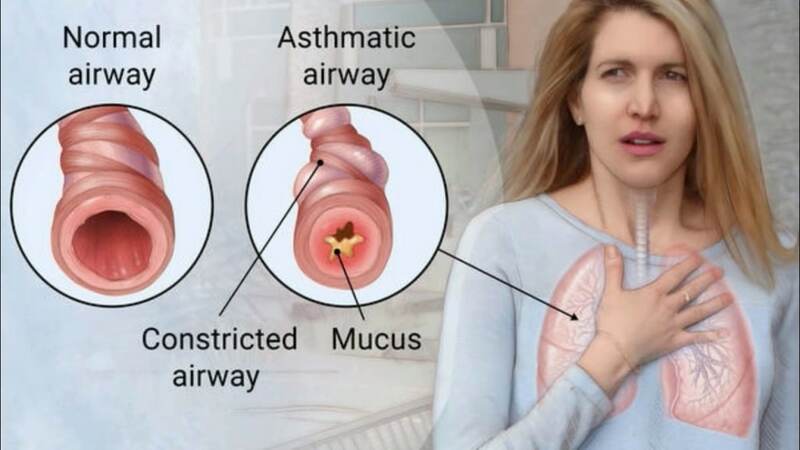 Conventional rescue inhalers (such as Albuterol) address the bronchoconstriction (tightening of tiny muscles in our airways) and are a key component of emergency management, but it takes long-acting maintenance medications to reduce the swelling. While these drugs are often effective, they come with adverse side effects. First of all, reduce the severity of someone’s symptoms. This can be done with conventional medicine such as anti-histamines, but a more natural approach with less long-lasting side-effects would be to add quercetin, nettle and vitamin C to a person’s daily intake. Secondly, we should aim to remove the antigenic load, i.e. the external “thing” or “things” that can be identified as the culprit behind the symptoms. This could mean removing a carpet or bedding that houses dust mites, cutting out foods that create an allergic (inflammatory) reaction such as gluten, dairy, peanuts or reducing our exposure to pollen if possible. We could also assist the body in removing histamine that was produced as a first allergic reaction, e.g. with increased vitamin C or a vitamin B complex. Then, in the next phase we concentrate on repairing barriers, i.e. the mucosal surfaces that came in contact with the antigen (“irritant”). Our mucosal surfaces are found in our nasal passages, lungs, eyes, gut and genito-urinary tract. These barriers are the first line of defence between ourselves and the outside world and their repair is vital in the overall approach to improve asthma (and other allergy) symptoms. Barrier repair can be greatly helped by replacing specific nutrients like vitamin D, zinc and a zinc-carnosine combination, glutamine, vitamin A, or botanical medicines such as liquorice root. The environment inside our gastro-intestinal tract determines whether or not our immune system over-reacts and produces inflammation that is so typical of asthma and allergies. Undigested food particles in the bloodstream can be seen as “foreign” and may elicit an immune response, hence optimal digestion and adequate stomach acid are two essential areas to focus on. Digestion can be helped with digestive enzymes or Swedish bitters and stomach acid levels can be increased by HCL supplements, if needed. A healthy gut environment also means healthy, happy gut bacteria. In optimal conditions, these tiny organisms can support immune function and help regulate stress responses. An imbalance in these bacteria (dysbiosis) is a component of allergic diseases and needs to be corrected in asthma and allergy sufferers. Increasing fermented foods, such as sauerkraut and kefir and/or taking probiotic supplements is a simple way to help re-balance our gut bacteria. A comprehensive stool test can shed further light, if symptoms persist. Last but not least, de-stress! This is a way to rebalance the main parts of our nervous system, and it can have a direct effect on asthma and allergy symptoms. One of our stress hormones, adrenaline acts on mast cells in the body to release histamine and so start an allergic reaction. Cortisol, another stress hormone, is released after adrenaline and is very damaging to the cells of our gut lining. Many allergy and asthma sufferers have noted an increase in their symptoms as a result of stress. Less adrenaline in our bloodstream can help to reduce tissue swelling and constriction of our airways, while less cortisol means that our immune system is not unduly, unnecessarily activated. IgE food, inhalants and cross-reactivity tests, IgG food sensitivity tests, comprehensive stool analysis, vitamin D and over-all nutrient levels and heavy metals, as mercury can exacerbate asthma symptoms. Additional tests may also include genomics, to verify a person’s genetic disposition to inflammation, stress, detoxification, etc. My thanks to Dr. Kara Fitzgerald.